Blog Quick Quotes: Holiday Celebrations with Neva! Happy Saturday Quick Quotes friends, it is December! 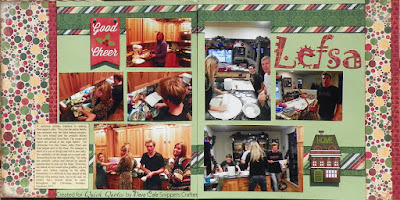 Neva here today to share a holiday themed layout featuring a tasty Norwegian treat, lefse. It's so important to document family traditions! Several papers from the Holly Jolly Holiday collection was fantastic to showcase our baking adventures. The background is side B of Holly Jolly Holiday 103. The side dots are side A of Holly Jolly Holiday 103. The left side is trimmed to 3" and the right side is trimmed to 1.5". Holly Jolly Holiday 105 is used along the side and is trimmed to .75". All the vertical sections are inked with Barn Board PowderPuff Chalk Ink. The side sections are adhered together then adhered to the layout. The vertical paper is Holly Jolly Holiday 101. Four sections are trimmed to 1.75" and 4 sections are trimmed to 1". The bottom uses the stripes over the green pattern, then it is reversed for the top sections. All edges are inked in Evergreen PowderPuff Chalk Ink before adhering together. 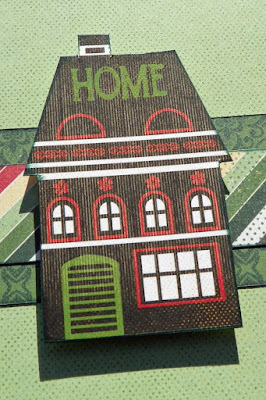 The title is die cut from Holly Jolly Holiday 105. As this was a lengthy story to journal, I printed it on a section of Holly Jolly Holiday 100. Next, I inked the edges in Evergreen PowderPuff Chalk Ink. 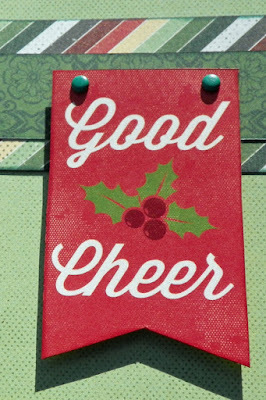 I selected the Good Cheer section from Holly Jolly Holiday 500 and trimmed it down to just the banner. The edges are inked in Barn Board PowderPuff Chalk Ink. Two green brads are used to accent the corners before attaching to the layout with dimensional foam adhesive. The "HOME" was trimmed down to just the sweet little house. 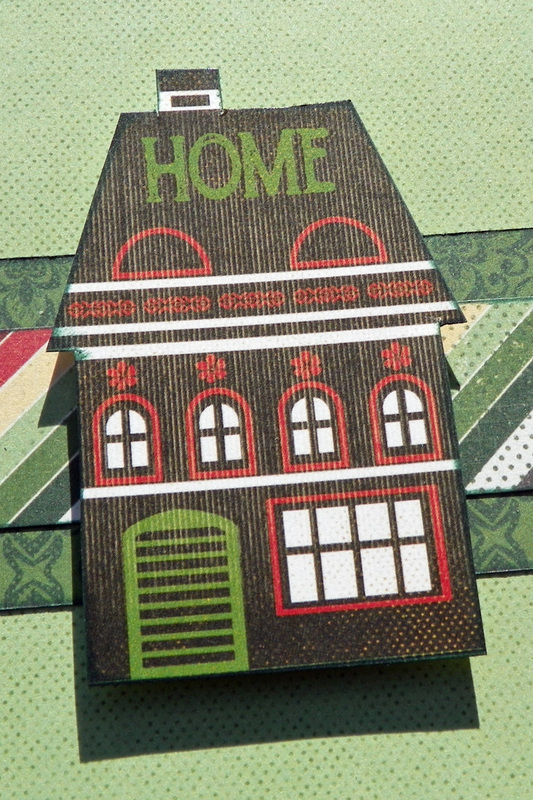 Homes edges are inked in Evergreen PowderPuff Chalk Ink. The home is adhered with dimensional foam adhesive. The close-ups show the slightly distressed design of the papers, which is just lovely! I think the festive colors of the Holly Jolly collection is great for all of your fun holiday themed layouts this time of year. The card fronts from 500 can also be used in different ways as shown above. Have a little fun and create a layout about a family tradition too! Thank you so much for stopping by, and enjoy the preparations for your holiday season! Don't forget, you can play along with your Holiday Celebrations challenge this month right here.